I don’t believe I’ve eaten as much duck as I’ve have while living in Paris. Don’t get me wrong, there are plenty of duck specialists in Singapore and a lot of opportunities to eat the quacking fowl. It’s just that while I’ve never been too fond of the oily flavor and dry texture of the meat, I’m rendered helpless in front of a thick, creamy slab of duck foie gras. 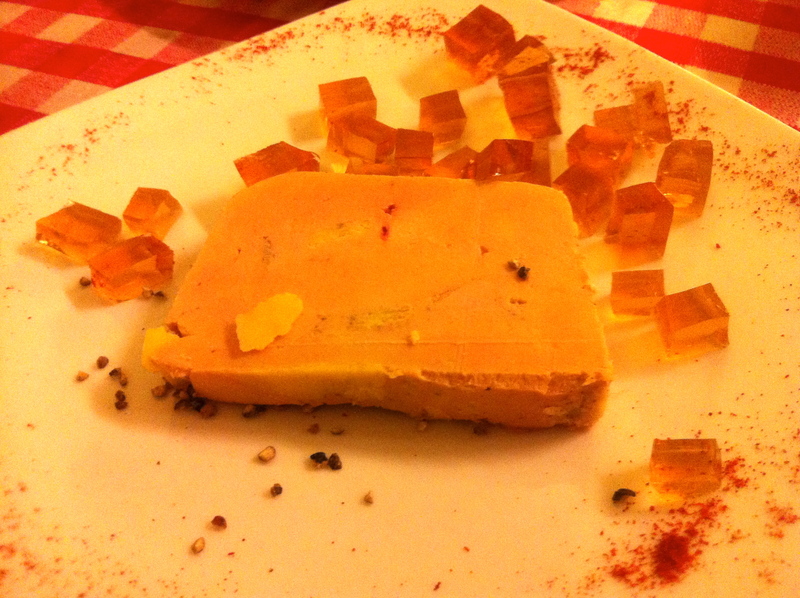 Eating foie gras can be very taxing on the body and the wallet, so it’s fortunate to have friends steer us to Domaine de Lintillac, where we can at least guard our pockets while our cholesterol levels spike. Domaine de Lintillac is a mini-chain of traditional restaurants serving duck, duck and more duck. The products are sourced directly from farms in the small Corrèzien village of Lintillac, allowing the restaurant to serve quality food while keeping costs relatively low. Here, the foie gras, either served in cold blocks or warm, just-seared slabs cost 12e-18e, substantially lower than prices at well-regarded restaurants but of better quality than those served at your run-of-the-mill bistros. After the foie gras one proceeds to equally ducky mains (priced between 10e-16e), be it a rosy piece of roasted breast, or a generous leg of duck confit hiding under a layer of crackling skin. The meat is simply seasoned and cooked, served with rustic sides of salad greens and maddeningly fragrant roasted potatoes. For those like me who do not enjoy the unadulterated flavor of duck, one can choose a variant of the meat as plat. 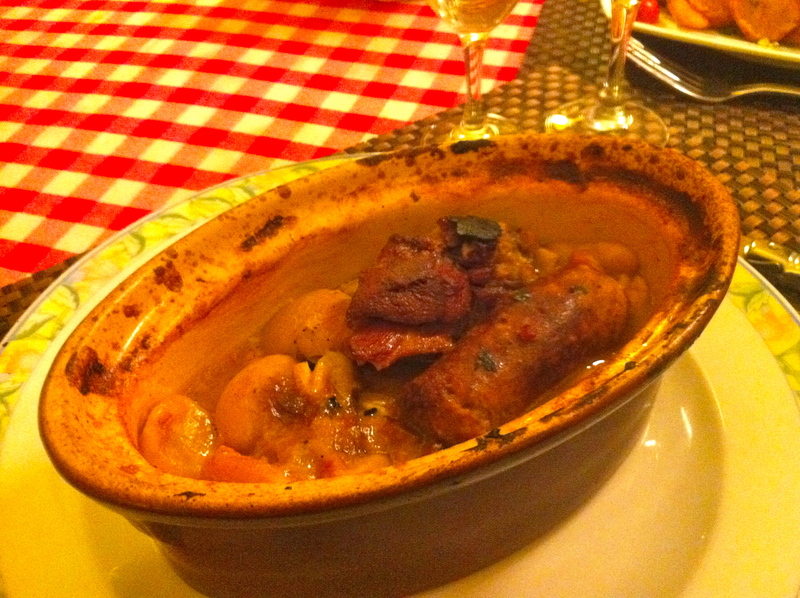 The cassoulet with beans, duck and sausage was rich and hearty, the white beans well-cooked in duck fats and meat juices, but of a small enough size for one to finish without falling into a food coma afterwards. 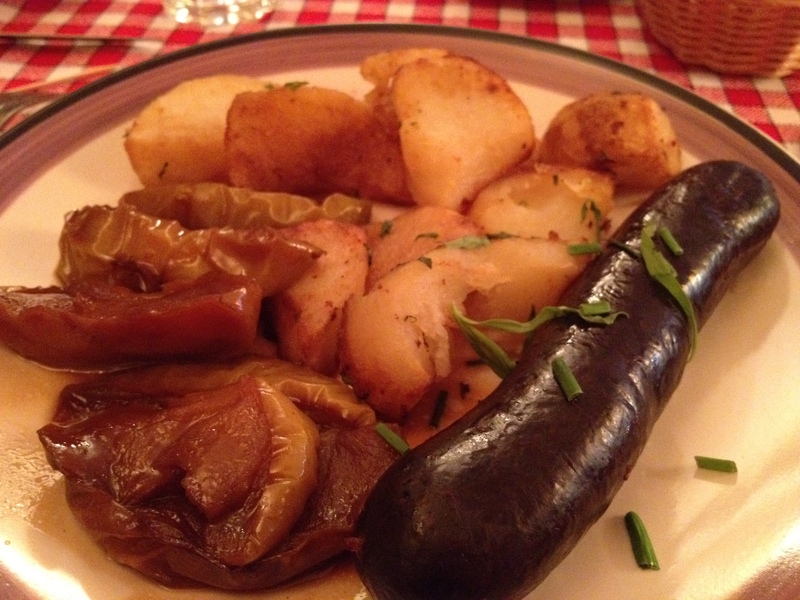 On our last visit to the 7eme branch, I tried the boudin noir made with duck’s blood and a filling of chestnut, the sweet, nutty flavors working harmoniously with the caramel flavor of the sauteed apples. 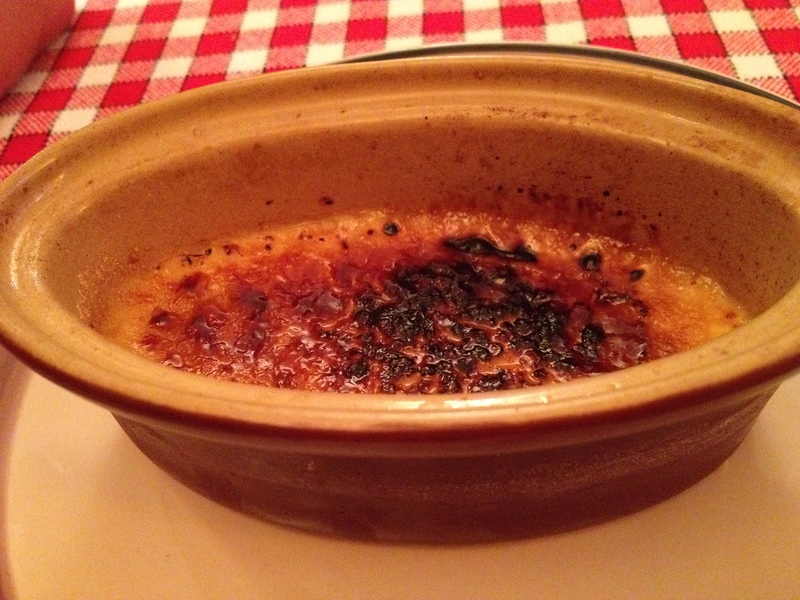 Even the non-duck desserts were pretty good and P was most satisfied with his ramekin of creme brulée, a fine specimen that was neither too soft nor too hard, with a strong perfume of vanilla and a thin, blackened crust of burnt sugar. The Domaine de Lintillac restaurants, complete with heavy wood finishings and checked table cloths, feels more like rustic country inns than restaurants set on the crowded streets of urbane Paris. The hospitality, like the prices also harks back to older, simpler times, with a warm welcome and service that is courteous and never rushed. And the best part about the restaurant? You can bring a piece of it home, in tins of foie gras or duck confit, to be eaten whenever the duck craving strikes! 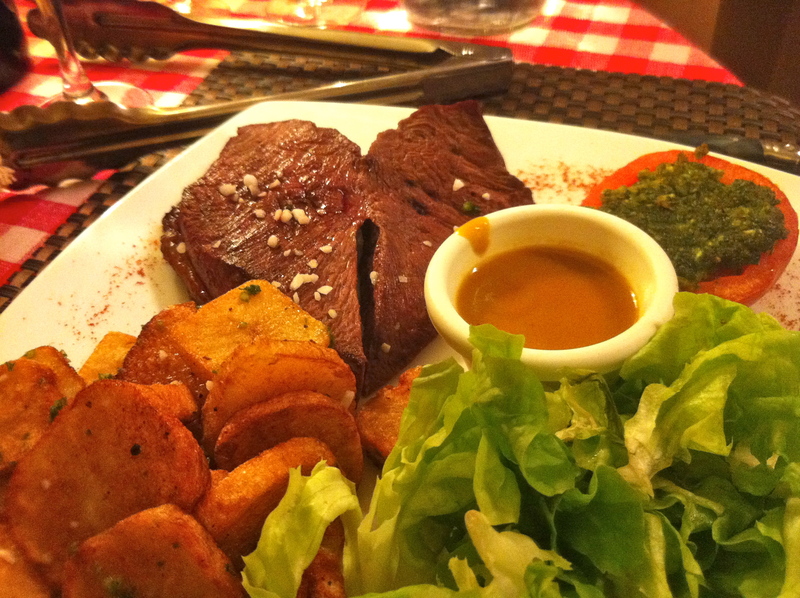 This entry was posted in 7th arrondisement, Cuisine, Eat out, dine in, eating out, Location, Paris, Traditional French and tagged duck confit in paris, paris duck restaurant. Bookmark the permalink.